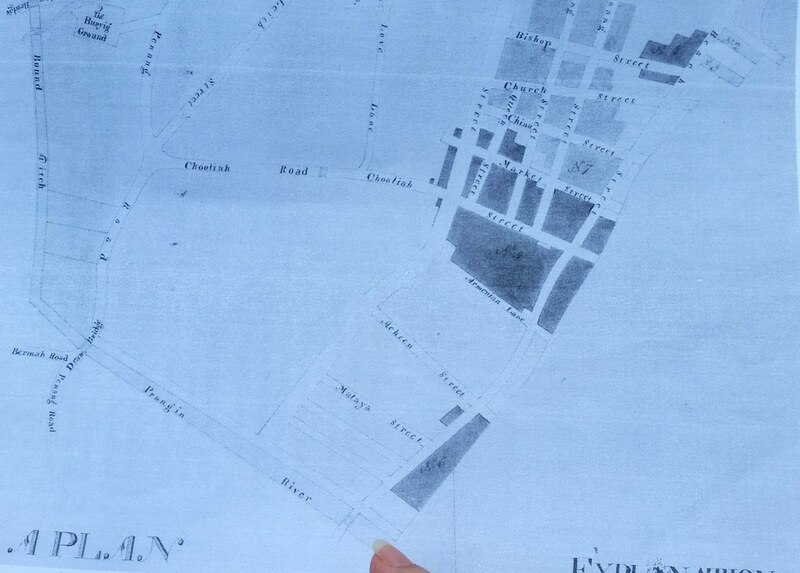 This is what Prangin Canal or Sia Boey in George Town, Penang, looked like in 1830, when the canal was much wider, leading out to the coast, which at that time faced Beach Street (before early land reclamation extended the coastline further away to Weld Quay). You can see the Acheen Street Mosque at the top left. And the hill in the distance, across the channel, is Bukit Mertajam. The road leading to the bridge over the canal is Beach Street. Now, look at the two pillars holding up the centrespan of the bridge in the sketch. I spotted them the other day during a visit to the site (below). Prangin Canal back then was much wider. 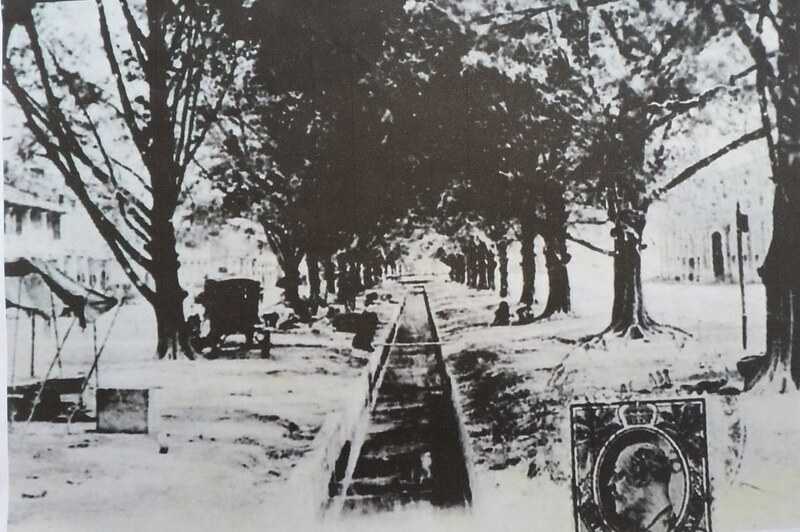 Among other things, coffin-makers along Carnavon Street used to transport their coffins to the canal, from where it was then shipped out to coastal centres nearby. 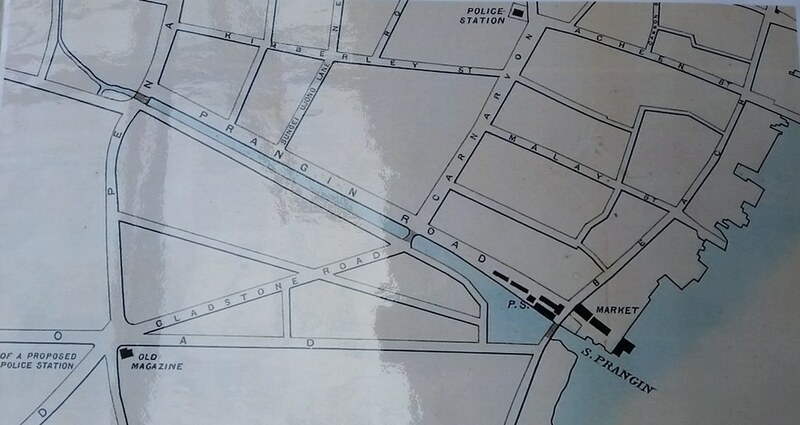 The canal itself extended westwards from the coast down to where Transfer Road is now and then turned 90 degrees northwards to emerge at the coastline along Northam Road. The canal served as a defensive ditch around old George Town; the name Sia Boey itself means the tail end of the town. So it is surprising that the Unesco heritage core zone does not extend right up to this old boundary. Instead, the Unesco core zone is much smaller. Greening work is now being carried out to create a heritage arts district and a park as part of Phase 5 of Komtar. 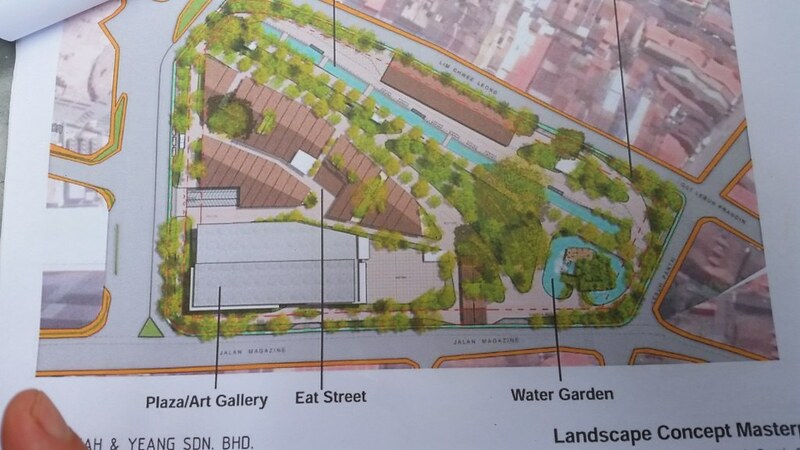 The Ilham Penang art gallery by the Zainuddin Foundation is going to take a huge chunk of the ‘park’. 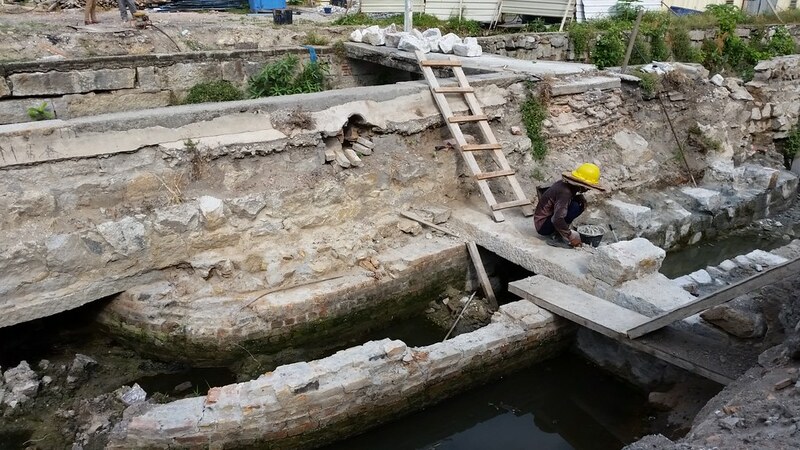 During the work, some of the remains of the old canal were unexpectedly discovered. This was near a ‘bypass’ of the old canal, close to the former site of a saw mill, around which the soil is a bit darkened to this day. 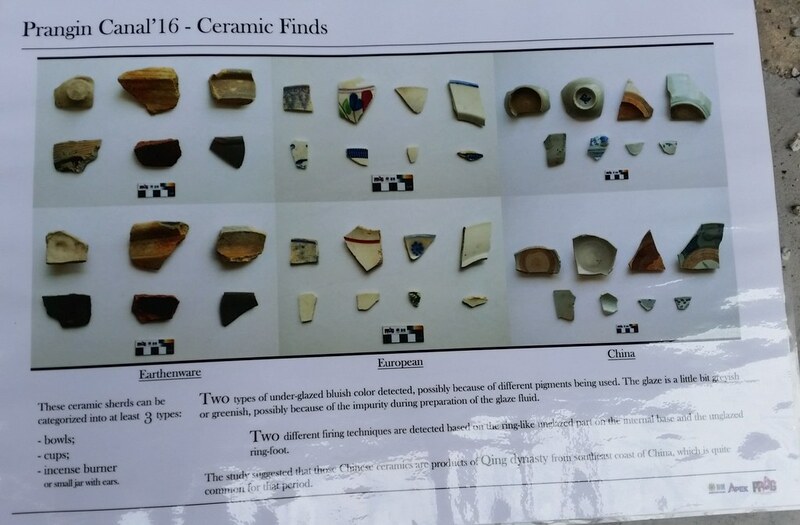 Archaeologists and heritage enthusiasts are excited about this new find. 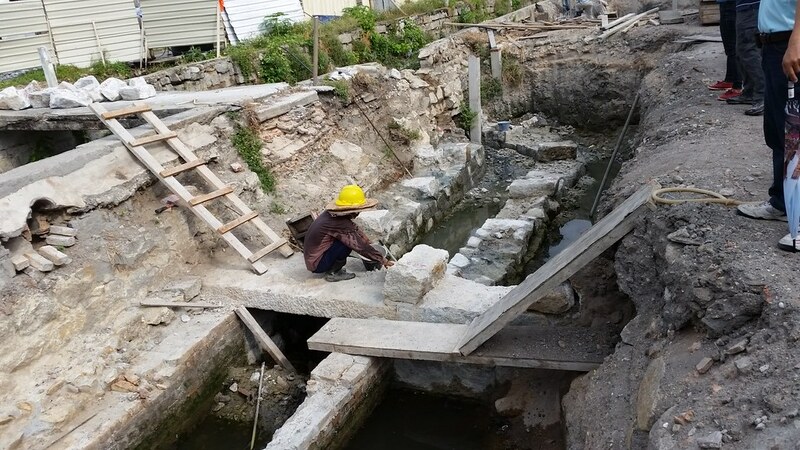 Already shards and ceramic pieces have been unearthed, and the area holds promise of being the only site in George Town where the most meaningful archaelogical excavation work can be carried out to unearth the different layers of history of old George Town. Unfortuntely, if the proponents of the Komtar-Airport elevated LRT system airport have their way, a monstrous LRT station perhaps with a commercial complex attached would have to be constructed over a significant section of this canal and designated park, perhaps over or near the old bridge over the canal in the sketch above. Such a large station and or complex would not be needed if a street-level interchange is situated nearby, so that the canal and the rest of this heritage area need not be disturbed. 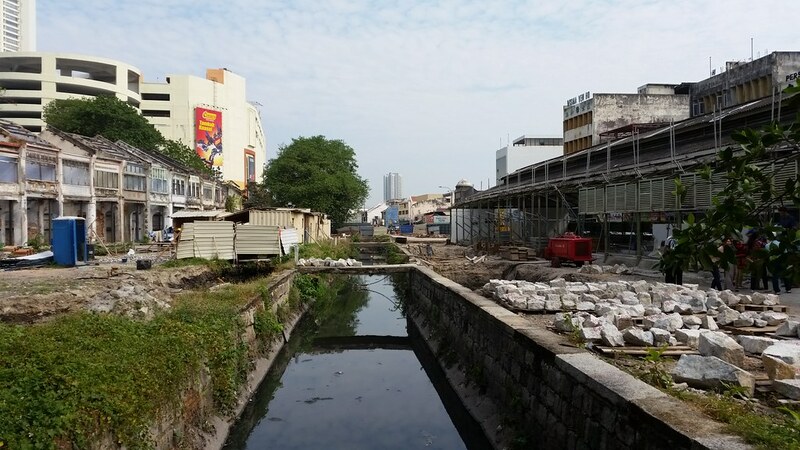 This is another reason why an elevated LRT and monorail system would not be in keeping with the heritage character of George Town – apart from being three to four times more expensive than street-level light rail/new generation trams insfrastructure. Phase 4 of Komtar was meant to be a park but surprise, surprise (not really), it ended up as a large concrete mall during the BN administration. Now under Pakatan, Phase 5 of Komtar, which is supposed to be a green heritage area, could end up with a large concrete art gallery at one end and a massive LRT/monorail station complex at the other, leaving only a tiny green patch. So much for parks and a heritage district. It is still not too late to abandon the expensive elevated LRT and monorail options in favour of a street-level light rail system and bus rapid transit. In fact, the old ACS (later became known as Li Tek Primary School) can be seen at the background of one of the pictures you posted, the one showing the narrowed canal. I have a digital copy of the old Anglo Chinese Boys School which sat at the junction of Penang Road and Prangin Road, probably fronting the canal then. I don’t know how to paste the picture on your blog. This school was later renamed Li Tek Primary School before the building was torn down in 1975 to make way for KOMTAR. Maybe someone could tell us more about the renaming. Send if you can, please. I will try and repair the ‘submit photos’ link on this blog in a day or two. Please check back again soon. 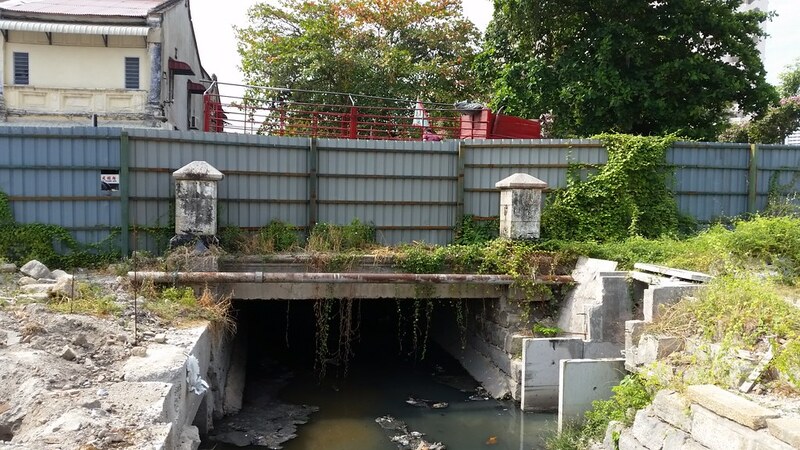 Latest escape from that big aquarium “Alcatraz” at Burmah Road can be found along the drains of Jln Kedah near the service centre of YB Chow. Comic book lovers can look forward to up-close-and-personal encounters with their favourite comic artists, take part in forums and get a two-day unlimited access to the comic museum during the grand opening (May 28-29) of the Asia Comics Cultural Museum (ACCM) on Level 2 of ICT Mall in Komtar, Penang. Thanks for the information, Anil. There’s so much more to Penang than what’s being showcased up till now. 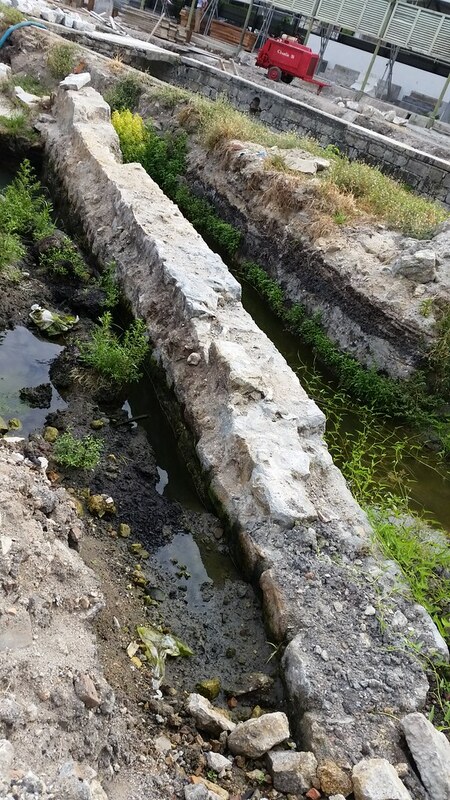 I hope the preservation of this canal and other historical sites will remain while we inevitably “progress”! Yes, Jude, it’s a historical treasure trove. And a lot of psychic energies, some of which may replay like a movie! Just go there at 3am & witness. Anil may not understand the dialects 🙂 🙂 🙂 whispered! And you wonder why some countries have more tangible & intangible historical artefacts & living museums (of human & cultural elements) than some ultra-modern countries which lament day & night at their loss due to careless development, which holds no long term value for the foreseeable future. Which comes to the undeniable worldwide recognition of cultural assets which now draw tourists by the droves to those countries that own such authentic treasures worth priceless in the name of global tourism, an industry growing rapidly at the demise of manufacturing & even some service industries. A new tourist attraction will mean more cars and vehicles there that will join the kapchais in blocking street level train/trams. It’s about as practical as the cable car idea as a means of transport. Should revitalize the canal, get locals to kayoh sampan like in Venice, and also revive the vintage scene to blend well with cosmopolitan high rise landscape.